Newly Redecorated Condo in Grayhawk, Scottsdale! This is a BEAUTY!! 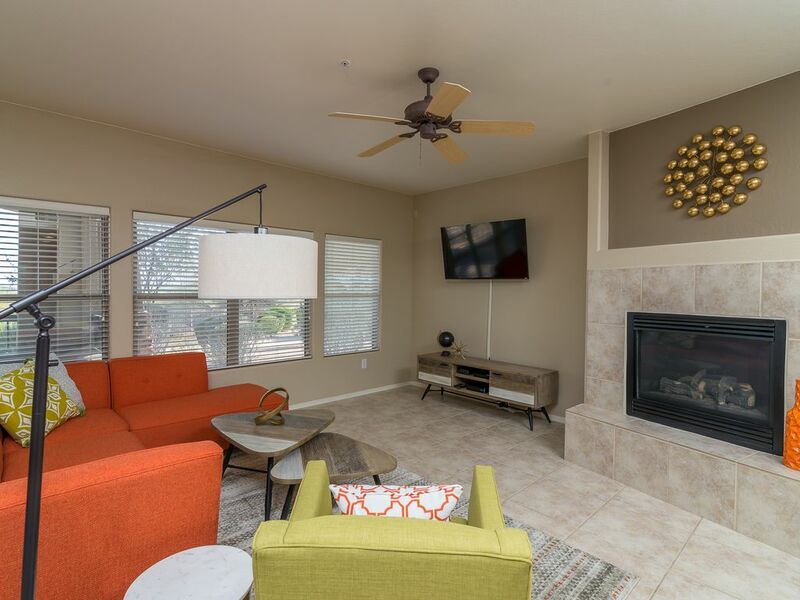 This beautiful newly decorated condo in The Village at Grayhawk Condominiums is lower level (no stairs) in highly sought after Grayhawk in Scottsdale. The unit includes everything you need including sheets, towels, kitchen necessities & even laundry. All you need to do is bring your clubs and a swim suit and you're ready for your vacation! This 1,729 sf unit is great for the family, golf trips with friends, girls trips or to use as your winter home away from home with room for the kids and grandkids to visit. This 3 BR, 2 BA unit includes a 1 car garage, 3 community heated pools with grills & hot tubs and GORGEOUS mountain views from nearly every room! You also have a great workout facility at your disposal. THIS is the one you've been looking for!! Minutes away from the Grayhawk Golf Club as well as golf courses such as Kierland, Troon North, TPC (home of the Waste Management Phoenix Open) and MANY others. The upscale Kierland Shopping Center is less than 10 minutes away where the dining options range from family friendly to high end steak houses. Spring Training Camps are scattered throughout the area so you're never far from your favorite team. Hiking trails are abundant and you're an easy drive to Sedona, the Grand Canyon and many more day trips. NOTHING is far from Grayhawk which is what makes this the perfect unit for your vacation. You are welcome to e-mail me with questions. I usually answer within 24 hours. We are people who love to travel and in doing so have stayed at many vacation rental homes. We've come to understand the things that make a stay comfortable and hope that you find our vacation rental as comfortable as if you were in a 5 star hotel. We chose this property because of the single level living as well as the beautiful mountain views from nearly every room. In addition to the newly remodeled home itself and the beautiful views, we love that you have 3 pools to chose from. This unit is the perfect fit for nearly every couple, family or group of friends. From beginning to end, cannot say enough positives. We thoroughly enjoyed our stay. The condo is perfect for us and it was very well furnished all the way down to extra batteries, light bulbs, paper goods, hair dryers, cleaning supplies, cooking supplies, and many other niceties. The desert view out the back is beautiful. Coming back next year!!! It was an absolute pleasure having you as our guests. We look forward to hosting you again next year! This condo is great from several perspectives. First, it is in a quiet, gated community with swimming pools and workout rooms. Second, the condo itself is immaculate, supplied with everything you will need to enjoy an extended stay (my wife and I spent 9-1/2 weeks in this unit while I was undergoing treatment at Mayo-Phoenix). The kitchen is very-well supplied with new nonstick pots and pans and all of the utensils we needed. There is a large empty walk-in closet to store your things during your stay. The condo is ideally located. Fry’s, Safeway, Sprouts and Walgreens all less than ten minutes drive. Mayo’s Phoenix campus also about 10 minutes away, as is central Scottsdale. The owner, Jennifer, was on top of every minor problem. She immediately replaced cookware that was damaged by previous tenants, as well as light bulbs and a door stop. Her handy man was on call to maintain the unit. I thought the area we stayed in was very nice and the accommodations were great also. The weather was perfect for golf with my brothers every body had a good time. I cannot find one detail about our stay that fell below 4 star accommodation. Most of it was 5 star. Clean. Gorgeous dessert setting. Excellent attention to all items in this groovy condo. Modern. Fully equipped. Quiet and bright inside and out. Nice pools, too. Our family of 4 are fortunate to have stayed here. fantastic accomodations located in a fantastic complex. So glad you enjoyed. You were a great guest. We appreciate your review! Thank you so much for making our Scottsdale trip phenomenal from check in to check out. We couldn't have been more pleased with the cleanliness, beautiful decor and all the space! We had everything we needed other than food. We will be back. Oh I’m so glad you enjoyed! Hope to see you back again! Make sure you visit for the Barrett Jackson Auto Show and the Waste Management Phoenix Open. Also, don't forget to visit Old Town Scottsdale, Sedona, The Grand Canyon, Prescott, Karchner caverns, Kierland Shopping and your favorite Baseball team for Spring Training! There are SO many things to do and see out here that it's impossible to list everything!